Commercial TV Systems provided by your local TV Services engineer. 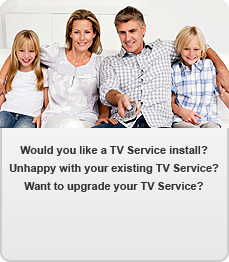 TV Services specializes in fitting multi-link cable and satellite systems. Using the latest in technology and equipment, we provide our clients with the most up to date Satellite systems with a full guarantee at very competitive prices. This system uses one satellite dish to supply cable TV channels as well as Sky, Sky+, HD and free to air TV channels to as many as 200 rooms or apartments. Apartment Blocks Why TV Services? The system we use is a free to air system and allows all rooms receive cable TV which gives the viewer up to 25 channels. It is a very cost effective system for these types of developments as there is a one off payment which does away with monthly bills. For a list of sample channels available, click here to download PDF. The system we use does away with unsightly satellite dishes seen on apartment blocks and allows all apartments to get cable TV as well as satellite signal from one dish mounted in a discreet location. Do you have an apartment block with satellite signal required at each apartment or tired of looking at all those unsightly dishes on the one block then this is the system for you. An IRS System is the most flexible type of system to use for communal satellite systems and is Suitable for apartments blocks big or small and provides the end user with the choice of what they wish to watch or listen to. Receive Sky service (Monthly subscription). And all this can be done using one dish and one aerial combined into a 5 wire IRS system. For the provision of Sky+ we will require 2 cables to be ran from the IRS system to the apartment. Tenants can choose between Free to air or subscription based services. SO GET YOUR APARTMENTS UPGRADED NOW!